Home » Events and Blogs » Blog » Recipe of the week: Coconut Flour & Oat Cookies! 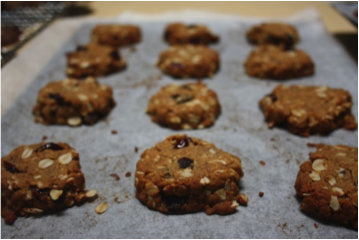 Recipe of the week: Coconut Flour & Oat Cookies! Pre-heat the oven to 150°c. Line 2 flat biscuit trays with baking paper and set aside for later. In a large bowl mix together the rolled oats, coconut flour, buckwheat flour, ground flax seeds, cinnamon, nutmeg, coconut sugar, raisins, cranberries. In a small saucepan gently warm the coconut oil and honey. Using one of your measuring cups, blend the bi-carb soda with the boiling water and add to the honey mixture. It will bubble up a little. Add this to your dry ingredients and mix well. Mound heaped teaspoonfuls onto your baking trays, leaving a little room for the mixture to spread. Bake for 20 minutes or until golden. Allow them to cool on the trays before storing in an airtight container.